Welcome to our newest ABG Capital blog series! The CEO of ABG, Jeff Tapolci, is always looking for events going on around Pittsburgh where he can learn new things and promote ABG. This is something that we consider part of The ABG Way and that is something that Jeff takes very seriously. He usually goes to a few of these events each week and there is always something to say about them, so we figured that we might as well fill you in! On Monday this week we had our quarterly board meeting. I’m sure you would agree that board meetings are always the best way to start off a Monday! Well maybe we should rephrase that… The gatherings AFTER board meetings are always a great way to kick off a Monday! 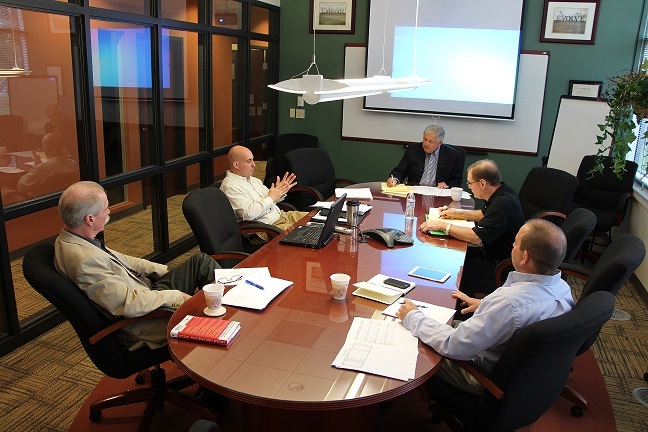 During this meeting our board members had the opportunity to discuss some important ABG news. The top executives issued a state of the union for their respective companies as well as a status report, and they reviewed the 1st Quarter to ensure everything was going according to plan. Their ultimate purpose is to serve as an entity that establishes accountability and offers problem solving guidance to ABG and its portfolio companies. At ABG Capital, we’re lucky though, because our board meetings usually aren’t that bad. We’re not saying they’re fun, but we’re not saying they’re unbearable either! Usually we even try to avoid the typical board room, but sometimes that’s just not possible. No matter how comfortable or uncomfortable we are for the meeting, we always find that the best part is wrapping the meetings up with action items and then heading out to relax. This may seem unconventional compared to other board meetings, but that’s how we operate under The ABG Way. In our case, we chose to unwind at Cadillac Ranch with dinner, drinks, and cigars. Along with Jeff, we had John Nemcek, Santo Laquatra, Jason Tapolci, and Adam Scott. Dan had to head home because he wasn’t feeling too well. This was a relaxing night filled with some quality male bonding time for the good ol’ boys. One of the most memorable parts to this night were the stories that Santo couldn’t resist sharing with everyone. If anyone knows Santo, you might find this a little hard to imagine because he’s a very quiet and reserved guy most of the time. He was going on and on about the things he did while he was going to school at Cornell and playing football as well as when he was a kid growing up on the Northside. Outside of Santo’s entertaining stories, these guys still managed to talk about business and attempt to solve the world’s problems. Well at least any ABG problems. They love taking time out for relaxation like this because that’s where most of their ‘light bulb moments’ grow from. This is the time when their minds are free to think of things in a different light, while also just enjoy listening to some great stories! In the end, these meetings turn into just a bunch of guys hanging out trying to solve business issues. On Tuesday, Sharon Kolesar, our HR Manager, joined Jeff at the Pittsburgh Venture Capital Association (PVCA) for a luncheon that discussed psychometrics. The focus of this luncheon was on how to recruit, retain, and continue to engage the right people for your organization. The tool that they highlighted was called the predictive index (PI), and while we don’t use this exact practice at ABG Capital, it’s always nice to learn about other tools out there. There was so much to be discussed at this luncheon, but what Sharon and Jeff got out of it was that this PI tool can be used in hiring new employees and putting existing employees in the right seats. This goes along with what Jim Collins had to say in his book, Good to Great. This technique is designed to make sure that managers make the right decision when hiring new employees. They want to hire the best people for the open position as well as for the organization. We understand that when you hire a new person, you need to focus on growing that employee into a better worker than any other person in their industry. To be able to do this effectively, managers need to know who they want to search for, keep around, and ultimately keep engaged with the organization. Jeff is very active with the PVCA so he already knew most of the people there and was able to introduce Sharon to them. They even had the chance to sit with Kelly Szejko who is the President of the PVCA and her son, Ian, who is also involved with the PVCA. During this luncheon they also got to meet Jeff Kimball who is someone they’ve known about, but never actually met. Once they got to talking with him, they found out that he has moved on to a new chapter in his life and had become a Business Growth Consultant. A few weeks ago, Jeff and Sharon received a questionnaire that would be determine their own PI. They were given the results when they got to the luncheon and they were SPOT ON to each of their personalities! Even though we may not use this exact technique in our hiring practices, we use similar tools that provide the same results: putting the right people in the right seats. Tactics like these are what got me hired at ABG Capital and I truly feel like I’ve been put in the seat I’m supposed to be in! On Wednesday, Jeff Tapolci and Natalie DeCario, our Communications Specialist went to a relatively newer event in Pittsburgh called Network After Work. It was just like any other networking event, but it seemed more like a speed-dating atmosphere. We had some light hors d’oeuvre and drinks, got to know a few strangers, and handed out business cards until they saturated the room. It was a good time and we were able to meet a few new people and even catch up with some old friends. Jeff even ran into someone who knew his mom from one of ABG’s previous companies, Computer Comfort! That’s one of the great things about living in Pittsburgh; it’s big enough where you can always find someone new to talk to, but you can still find a familiar face in the crowd. Network After Work is and international organization and they have events like this all the time. This is only their second Pittsburgh event, but you can expect to see the third event happening in July at Bar Louie in Station Square. The venue for this event, Villa, was fantastic as well. We got to meet the owner who allowed us to see the upstairs portion of the building and it was a great space that we can see utilized for the different activities we do at ABG Capital. Like I mentioned before, Jeff is always at events like these so maybe you’ll spot him at one sometime! If you do, make sure you introduce yourself and let him know that you’ve been reading about him. Jeff Tapolciand Ron Eggert attended this event as a way to broaden their horizons and learn some new things about a different industry. Since most of ABG Capital is focused around technology, getting a look into the Energy sector was a good way for them to seek new opportunities and represent ABG. The symposium examined Energy from a World-Wide, U.S., and Western Pennsylvania point of view. There were industry experts, investors, politicians, business men and women, along with many other backgrounds who all shared a common interest in the Energy sector. This event stared with a few speakers from J.P. Morgan and then led into a panel discussion and then lunch. They even had the chance to walk through the Heinz History Center. The highlighted exhibit they have going on right now revolves around what it was like in 1968. As I mentioned before, ABG Capital has primarily focused on technology but you never know what you may find at an event like this. When I was talking to Jeff about this, he explained his philosophy to me; “I like going to things like this because I always learn something. It’s just like taking a class on the side that you might be interested in. It’s like think, if you never play outside of your sandbox, you might never see what the other sandboxes have to offer.” This makes sense if you know anything about Jeff because he is always looking for a bigger sandbox to play in! This entry was posted in Around Town with Jeff, small business and tagged ABG Capital, Events, Jeff Tapolci, Networking, Pittsburgh by Natalie DeCario. Bookmark the permalink.